Description Of Item: A Diamond Select Release! Sculpted by Gentle Giant Studios! The best-selling Marvel Select line has added another of the Marvel movie franchises to its lineup! This time the movie Loki makes his Marvel Select debut. 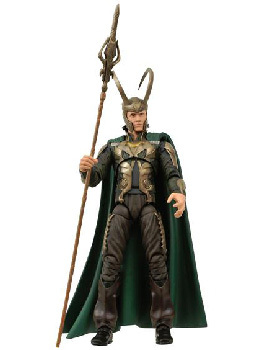 Based on the likeness of actor Tom Hiddleston from the upcoming May 2011 blockbuster, this movie-accurate Loki figure includes Marvel Select's standard 16 points of articulation. As an added bonus, the figure comes packaged with a display stand based on the mythical rainbow bridge that can be combined with the base from the Thor movie figure to form a diorama!